Bai Ji Guan Oolong Tea, according to the legend this tea name of this marvellous tea (White Cockscomb) was given by a monk in memorial of a courageous rooster that sacrificed his life while protecting his baby from an eagle. Touched by the display of courage and love, the monk buried the rooster and from that spot, the Bai Ji Guan tea bush grew. 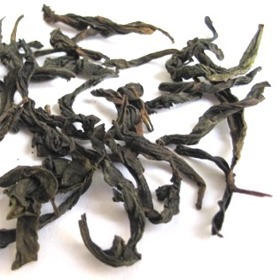 Bai Ji Guan’s wonderful complex taste makes it one of the best Oolong in the world. Organically grown. It starts off sweet, uniquely fruity with a toasty floral honeyed aroma and finishes with a lingering mellow fruit and honey note. The shape of the tea leaves are of ordinary Wuyi Oolong but the color is somewhat yellowish green. Dark amber infusion. This tea is good however not what I was expecting Bai Ji Guan is also known as “white Cox comb” because it is the only wu yi oolong with yellow almost white leaves. They usually pick it when it is young and tender. Bai Ji Guan is usually light sweet and complex with the flavor profile of honey suckle balanced with fleeting tannins. This Bai Ji Guan seems to have been composed of older more mature leaves. Theas leaves have been heavily roasted in the older more traditional Fijian style. The taste is rich dark Smokey with fleeting hints of sweetness the complete opposite of the Bai Ji Guan I am us to. Maby the producers thought it would be interesting to process the tea this way. If that’s the case they were right this tea is an interesting addition to my collection however ill take the younger lighter collard less roasted leaves over these any day. I very much enjoyed my sample and have re-ordered this tea. An otherwise normal comment, except for the fact I dont generally like wuyi oolongs. TeaCuppa has managed to change my mind about that on serveral ocassions, this being one of them. Very different from most, this one is deeply roasted, full bodied, yet sweet and fruity. A very enjoyable wuyi for those, like me, who arent big wuyi drinkers.